Complement the surrounding decor of a modern mantelpiece. 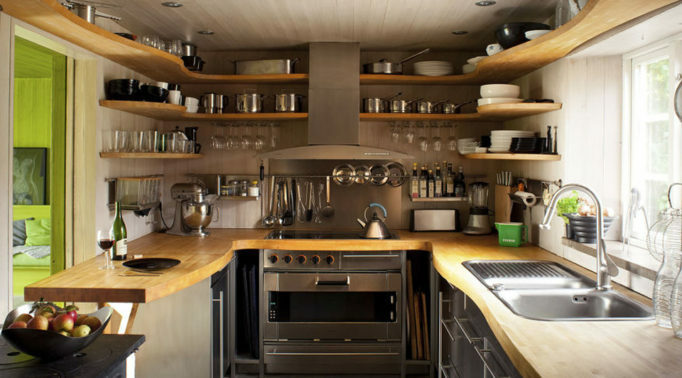 Contemporary homes with a mantel need decorative ornaments to uphold its modern display. 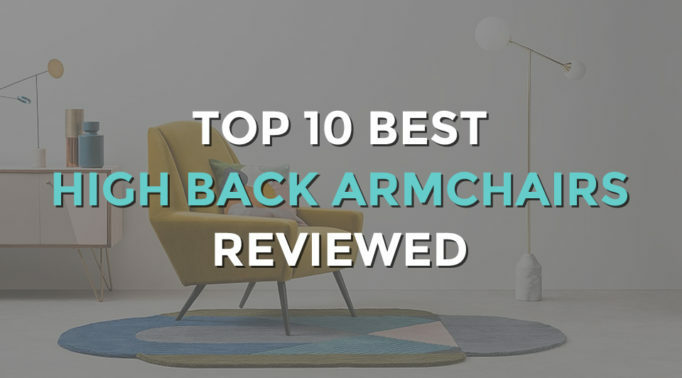 In between the various quirky and elegant trinkets, a mantel clock is a necessity, but not just any mantel clock; here are our top 10 best glass mantel clocks to complement the surrounding decor of a modern mantelpiece. 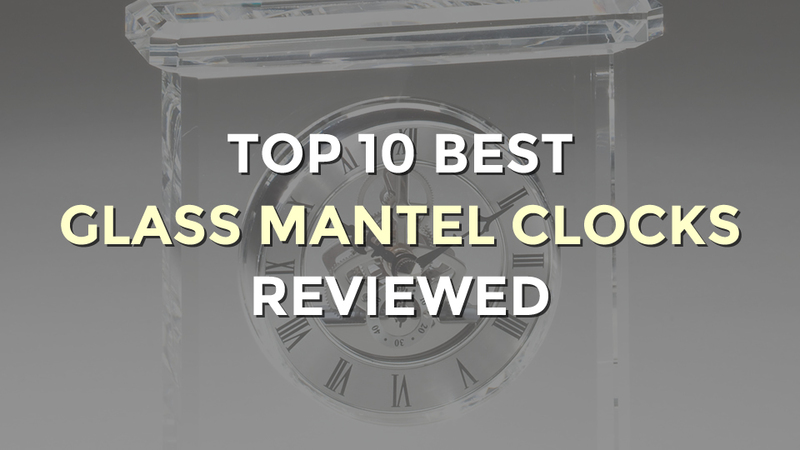 Designed in the UK by the London Clock Company’s own in-house team, the Arch Top Glass Mantel Clock shows off great attention to detail and skilled craftsmanship. The Roman numeral dial provides a classic appeal, and inside the battery-powered quartz movement guarantees accurate timekeeping. The body of this crystal mantel clock is rendered in frosted glass, with a floral flourish to one side and a solid glass base. It’s a compact mantel clock that fits in conveniently alongside other ornaments or photo frames on a mantel. The minimalist styling means this piece will blend well in any home, so it could be the best glass mantel clock to send as a gift. A stylish clock that features all the hallmarks of quality design, the Acctim Bewdley is part of the brand’s contemporary collection. The main body is finished in glass, with chrome elements making up the bezel and polished silver effect pillars to either side. The dial is produced in metal with Roman numerals and the second hand ticks almost inaudibly. Both the hour and minute hands feature a glow in the dark strip, so you’ll always be able to see what time it is. 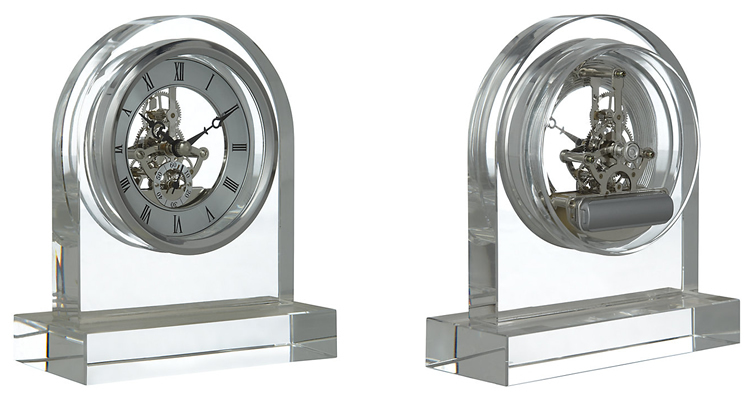 This quirky and unique Crystal Dome Skeleton Clock by the London Clock Company makes a bold statement with its transparent finish, providing a clear view of its inner cogs and wheels as they whir around to maintain accuracy. 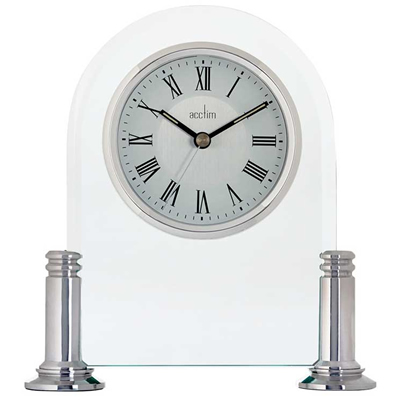 It’s finished with a silver bezel face, glass body and glass base, while metal dial is surrounded by Roman numerals, giving this distinctly modern clock a somewhat traditional element. 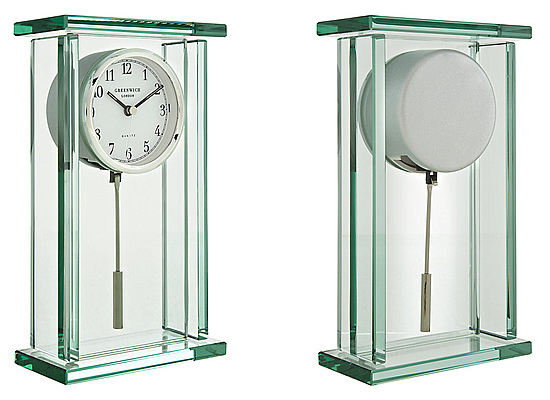 A subtle and clean looking timepiece, the Pendulum Glass Mantel Clock is finished in flat-topped glass, with a thicker glass base. 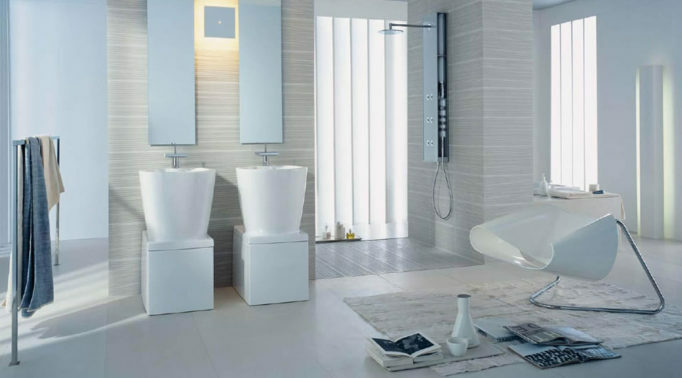 Conceived by the in-house design team at the London Clock Company, it’s a sharp-cornered piece which contains a pendulum movement within straight, angular lines. In black, the hour and minute hands contrast with the silver second hand, but the overall effect is neat and uniform, making it an excellent choice to display on an occasional table, shelf, or mantle in a modern home. 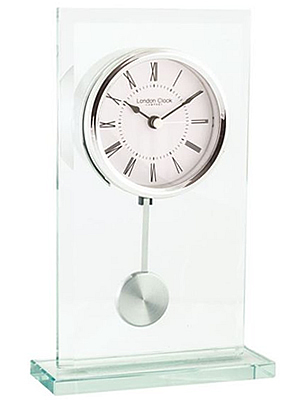 Combining functionality and with simplicity, the Dartington Crystal Small Curve Clock is constructed from optical crystal, giving it that elegant translucent finish. It may not be particularly large, but the sleek silver bezel, minimalist face, and thin black hands ensure that it will become a talking point. The battery-powered movement is of an excellent quality, so expect reliable timekeeping. It measures 10.8 cm tall and is presented in a black gift box, embossed with the Dartington logo. A great addition to the home, this undersized timepiece would look smart when placed on a desk, hallway table or mantelpiece. Dimensions: H15 x W14 x D5cm. 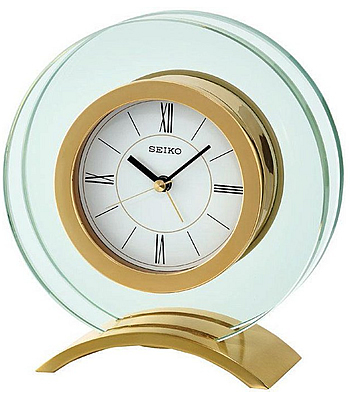 Seiko has been making timepieces since 1892, and their Round Gold and Glass Mantel Clock exemplifies the reliability and quality workmanship which the brand is famous for. Finished with a metal bezel in a rounded glass case, it features black hour and minute hands, alongside gold second and alarm hands, which match the outer casing. The face is white, and black Roman numerals invest the number display with an attractive, vintage feel. A practically designed item, this clock includes a quiet second hand and beep alarm, so it’s ideal for busy homes. 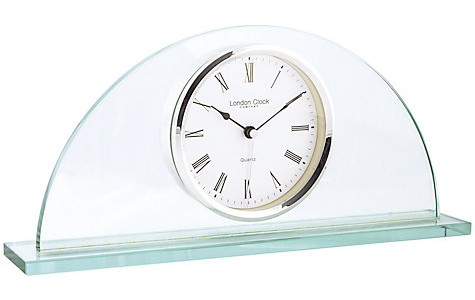 For decorating a study, lounge or office space with an air of retro chic, this Half Moon Glass Mantel Clock, created in the UK by the London Clock Company is ideal. Elegant and sleek, this timepiece is an excellent choice for modern homes, but would also make the perfect gifting solution for friends who appreciate contemporary chic. The face is clearly presented, making it easy to read, even from a distance, and Roman numerals give the clock a classic appeal. 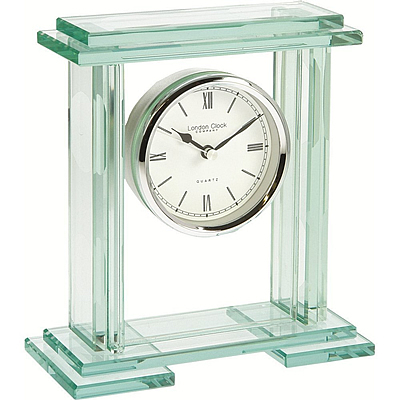 Finished in a half moon of glass, with a solid glass base, this clock will work well with the décor in any room. 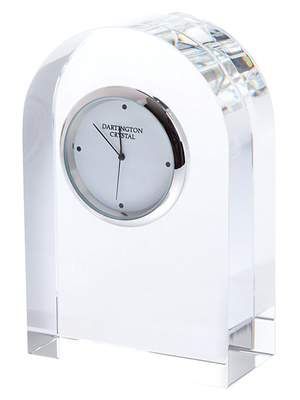 The status of Dartington Crystal as a world-class glassmaker is built upon mantel clocks such as the Dartington Crystal Curve Clock. It’s rendered in a 15cm tall arch of clear crystal, with a transparent finish that leaves the pristine silver workings on display. The mechanism’s various cogs and wheels are visible from both the front and the back of the clock, as they whir around keeping time. The face is finished in silver with elaborate black hands and Roman numerals are used to heighten the decorative effect. There’s plenty of space for a personal inscription and the clock is packaged in a stunning branded gift box. 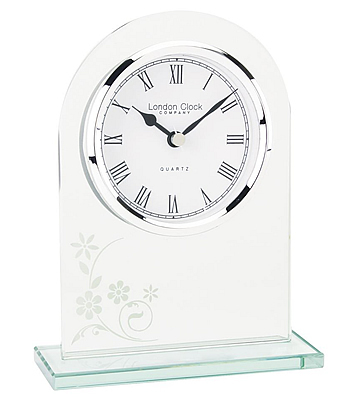 A precise sophisticated way to adorn a mantel, shelf or desk, the Modern Glass Quartz Mantel Clock is slightly taller than average at 19cm, providing an even more striking design. 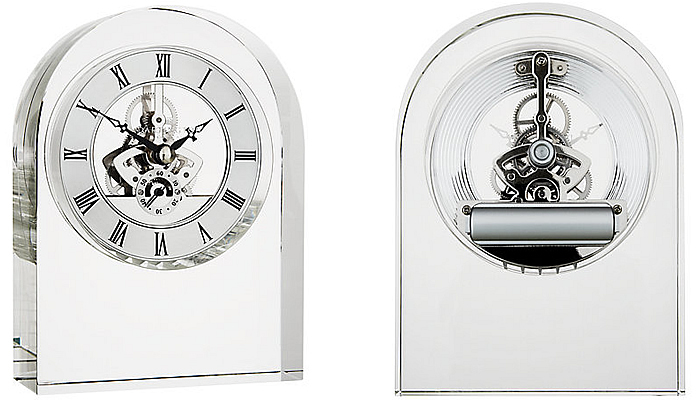 It is made from crystal glass crafted into the unmistakable shape of a traditional carriage clock. The base is constructed from glass plates, as is the angular top section, and the white face is set inside. With black hands and Roman numerals, this clock will provide an atmospheric, art deco feel wherever it is placed. Presenting a prominent show of design and luxury, the John Lewis Theia Pendulum is our best glass mantel clock for homes and offices where traditional styles and modern trends are equally valued. Rendered in solid glass, it features a wide flat top and base, and a subtle white clock dial surrounded by a prosperous-looking steel bezel. 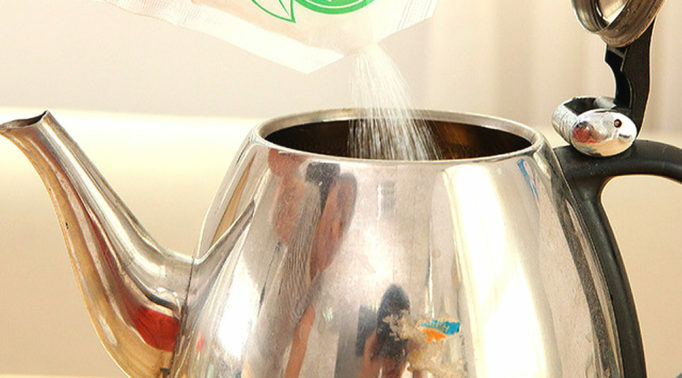 Below, the slim, stainless steel cylinder pendulum is displayed as it gently rocks back and forth. Tall, bold and beautiful, the Theia Pendulum Glass Mantel Clock by John Lewis will always impress guests in modern style homes.